When you are suffering from a fracture to your shoulder, elbow, wrist, hip, knee, ankle, or foot, you need an orthopaedic physician who is skilled at identifying and effectively managing your injury, as well as developing a treatment plan for complete recovery. 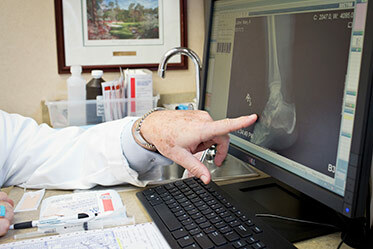 Many of our physicians at Guilford Orthopaedic and Sports Medicine Center are highly qualified in fracture management. Once the fracture is precisely identified, we provide a thorough plan of treatment tailored to your injury. This may include splints, braces, casts, metal rods, screws, pins, and other devices often used to help stabilize fractures and help bones heal quickly and efficiently. Your healing process and recovery time may take several weeks or months, which means your muscles will likely weaken and become stiff due to inactivity. Therefore, we will often recommend you undergo physical therapy and rehabilitation. Our highly qualified staff of therapists will lead you through strengthening exercises that will help restore your mobility and function. Read more on Fractures by clicking here.